Snowmen and snowflakes play a leading role in this theme's crafts, games, and many outdoor activities created to build social and motor skills. Decorate your daycare with our January banners, garlands, and posters. 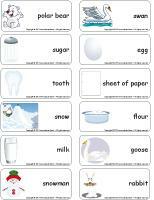 (Open thematic poster-White) Print, laminate, and decorate the walls of your daycare with all kinds of posters. 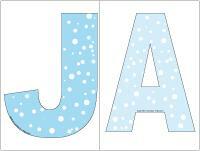 (Open January banner) (Open January banner-small) Print and laminate the banners. Use them to decorate your daycare. (Open educa-decorate-White) Print, cut out, and laminate. Use the illustrations to decorate your daycare and set the mood for the theme. (Open garland-White) Print. Let children decorate the garland. Cut it out and hang it within your daycare or near your daycare entrance. (Open educ-poster-White) Print and display. This garland must be prepared by the early childhood educator. Thread fishing wire through a needle. Use the needle to slide cotton balls on the fishing wire. Add small drops of glue on the fishing wire to hold the cotton balls in place. (Open craft-string of snow) Cut out the models. Place the model you prefer on a folded piece of paper and cut along the lines, leaving the sides intact. When you unfold the paper, the shapes will form a string which can be hung within your daycare. Use stencils to decorate your windows. Add a small amount of dishwashing liquid to white poster paint. This will make washing your windows easy when you wish to remove the snowflakes. If you prefer, you may use aerosol snow on your windows and mirrors. 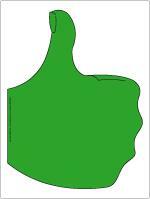 This special tool was created in response to a special request received (Open thumbs up/thumbs down). Print and display in a specific area or in your circle time area. (Open perpetual calendar-White Ball) Print and display to announce the special activity to your group and their parents. Invite children to wear as much white as possible, from their hat all the way to down to their socks. Replace regular light bulbs with "black light" bulbs or add additional lighting to create a special effect. Play fast-paced music. Make your daycare as dark as possible, and then suddenly turn the lights on. Children will be both surprised and impressed. They will enjoy moving to the sound of music. (Open educ-chat-White) Educ-chat is a game which includes several illustrations representing subjects, verbs, and predicates. 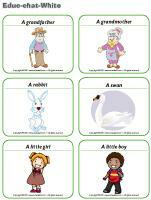 Use it to help children make complete sentences and add to their vocabulary. Print, cut out, and laminate the cards. Make three piles (subjects, verbs, and predicates). Have children pick three cards, one from each pile, and "read" the sentence. The sentences will sometimes be quite silly, that is what makes the activity fun! You can also choose to place the cards yourself and have a child "read" the sentence. We have prepared an imaginary game you can enjoy with your group. 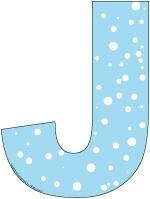 (Open thematic letter-Snow) Print the letters and prepare a special glittery envelope. Each day, deposit a letter inside and hide the envelope in an easy to find location. Invite children to find the letter. Read it to them and complete the suggested activities. The pictures may be used as a memory game or to spark a conversation with your group. Use them to decorate your daycare or a specific thematic corner. 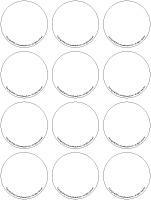 (Open picture game-White) Print, laminate, and store the pictures in a Ziploc bag or in your thematic bin. 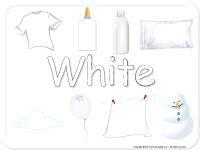 (Open activity sheets-White) Activity sheets are suggested for each theme. Print and follow instructions. 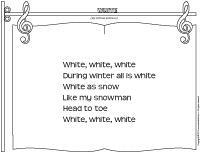 (Open writing activities-W like white) (Open writing activities-C like colors) Print for each child or laminate for use with a dry-erase marker. 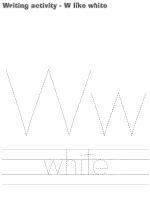 (Open stationery-White) Print. The stationery can be used to communicate with parents, in your writing area, or to identify your thematic bins. Offer only white, blue, and gray blocks. Create a snowy carpet using a roll of cotton batting and let children build on the snow. Bubble wrap can be used to represent ice. Fill a container with salt or sugar and let children play in it with toy cars. Add a few figurines. Children can pretend they are skiers or snowboarders. Decorate your corner with small snowmobiles, igloos, etc. Plenty of glitter and glitter glue. Construction paper, tissue paper, and any kind of blue, white, or gray paper. Salt that can be used to make a collage on dark-coloured paper. White chalk for drawing on dark-coloured paper. A model for making paper snowflakes. Cotton balls that children can glue on paper. Make snowflakes using glue and waxed paper. Draw the snowflake with the glue, let it dry, and gently remove it from the waxed paper. The result is spectacular! Paint with colourful ice cubes. Miniature marshmallows can be used to create a variety of winter scenes. Pictures of winter clothing or other items that can be cut out to create a mobile. White poster paint on dark paper. 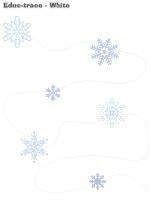 Snowflake, winter, and winter sports coloring pages. Chalk for drawing on dark paper. Winter clothing: mismatched mittens, wool socks, etc. A large pot and bowls for making and serving soup. Cups and pots for making hot chocolate. Decorate your corner with winter scenes. You can even make a fake window and add a winter scene in the background. Make a cardboard fireplace and add a few pieces of wood. Memory game related to winter. White, blue, and gray modeling dough. Add sparkles for a special touch. Association game related to winter sports (a picture of a skate with a picture of a child skating). Sugar cubes for building igloos. Miniature marshmallows for building snow banks. Stimulation bottles filled with wintery objects. Books about winter with magnificent illustrations. Photo albums filled with pictures of children playing in the snow. White and blue Christmas lights to create a magical relaxation corner. Puppets and stuffed animals (polar bears, snowmen, etc.). Snowball fight (crumpled pieces of paper). Container filled with water and blue food coloring. Container filled with sugar or salt. Hide white objects in the container. Container filled with real snow with mittens or gloves. Container filled with ice. Simply fill a container with water and leave it outside on a cold day. Children will love making figurines skate across the ice. Container filled with cotton balls. Container filled with whipped cream for a yummy treat. Container filled with powdered potatoes. Observe snowflakes using magnifying glasses. Catch snowflakes on dark paper. Melt ice or snow and freeze water. Paint snow with spray bottles filled with water and food coloring or old felts (from markers). Using a variety of thermometers, observe changes in temperature. What happens if you combine water and flour? Taste a variety of white food items (sugar, salt, icing sugar, flour, etc.). Bake a cake and top it with white icing. (Open storm scene) Print, laminate, and cut out. Children use the items to complete the scene. (Open picture clue story-Snow) Print. Sit in a circle with your group. Begin reading the story. Each time you reach a picture clue, pause. Children must guess the missing word represented by the picture. (Open sequential story-Snowman) Print the story. Laminate the illustrations and cut them out. Children must place the illustrations in the correct order to recreate the story. (Open game-This is my spot-White) Print two copies. Laminate and cut out the cards. Glue one copy of each card on the table using adhesive paper. Drop the other copies in a bag. Children take turns picking a card to determine their spot at the table for the day. You may also use the cards to determine naptime spots or for your task train. (Open my white path) Print, laminate, and secure the illustrations on the floor to create a path which leads to areas frequently visited by children such as the bathroom or cloakroom. If you prefer, the illustrations may also be used to delimit your various workshops. Empty approximately ten bags of cotton balls in the centre of the daycare. Let children have fun throwing the cotton balls up in the air. They can roll around in them and use them to build snow-covered roads. Let children explore toilet paper rolls and boxes of tissues. (Open lacing-snowflake with holes) Print on heavy cardboard and laminate. Punch holes around the contour of the snowflake and give children a shoelace or piece of ribbon they can use to lace the shape. Children pretend they are snowflakes. Give them instructions and have them act them out. For example, you can tell them they are spinning in the wind or falling to the ground. 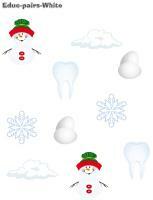 (Open models-small snowflakes) Print and cut out enough snowflakes for each child to have at least ten each. Deposit the snowflakes on a blanket or parachute. Children hold the edges of the blanket. When you give them the signal, they raise the blanket. As the snowflakes fall to the ground, children must collect as many as possible. If you wish, children can count how many they collected. Variation: Instead of tiny snowflakes, use cotton balls, Styrofoam balls, etc. Drape a white blanket or bed sheet over a table. Deposit a container filled with snow and figurines under the table. Add books about polar animals. Children will enjoy playing inside their very own igloo. Crumple pieces of newspaper or tissues to represent snowballs. Determine targets throughout the daycare and encourage children to throw the snowballs on the targets. Use empty tissue boxes, paper bags filled with newspaper, or any other recycled material you may have on hand to build forts or igloos. Deposit each child's mittens and boots in a pile in the centre of the daycare. Encourage them to find matching items as quickly as possible. The leader of the game must walk in a straight line, in zigzags, etc. in the snow. The other children must follow his tracks. Use your feet to draw a path in the snow. Children must walk only in your path. Go for a walk with your group and encourage them to notice the tracks you are leaving behind as you walk along. Show children how to lie on their back in the snow and move their arms and legs to make snow angels. Help them stand so they do not step on their angels. Find a snow-covered hill and take your group sledding. Laminate a piece of black construction paper for each child. Bring them outside and encourage children to catch snowflakes and observe them with a magnifying glass before they melt away. Select an object with your group. Have a child hide it in the snow. The other children must search for it. The child who finds the object can hide it for the next round. (Open educ-pairs-White) Print. Children must draw a line between matching items or color them using the same color. Print and laminate for durable, eco-friendly use. (Open educ-trace-White) Print for each child. Chidlren must trace the lines using the correct color and then color each item using the corresponding color. 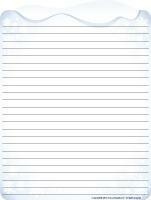 (Open educ-math-White) Print and laminate for durable, eco-friendly use. Children must count the objects in each rectangle and circle the correct number. (Open game-snow) Print. Children must associate each card to the correct activity. Children sit in a circle. Pick a child and invite him to exit the room. While he is in the next room, transform another child by depositing a large white blanket on top of him to make him look like a snowman. Invite the other child to re-enter the room. Have him guess who the snowman is. Fill a large container with sugar, salt, flour, or rice and let children play in it with figurines or small cars. Fill a container with clean snow and encourage children to build a snow castle. They will quickly realize that snow melts quickly and turns into water. Once the snow is all melted, pour a small amount of water in an aluminum pie plate. Deposit the plate outdoors and wait for the water to freeze. Explain the phenomenon to your group. Combine one cup of water with two cups of cornstarch. The mixture is ready when it can easily be removed from the sides of the container. The mixture appears to be liquid, but if you hit it, it will not splash. The mixture is liquid when it is not under pressure and solid when under pressure. Give a small handful of the mixture to each child. Ask them to form a ball with it. It will keep its shape as long as children apply pressure to it, but as soon as they stop manipulating it, it becomes liquid. If you are doing this activity indoors, have children work at a table. Have them wear paint shirts. However, cornstarch does not stain. At the end of the activity, simply brush children's clothing to remove any residue. Spread a small amount of whipped cream or shaving cream (depending on the age of the children in your group) on a tray for each child. Have children add a small quantity of water to potato flakes. The result will be a paste which is more or less thick and fun to manipulate. Encourage children to create a snowman shape. Beat eggs until peaks form. Serve the meringue at snack time. (Open puppets-White) Print the models on heavy cardboard. Have children cut them out and decorate them. Glue a Popsicle stick behind each model to create puppets. (Open stencils-White) Print and cut out the stencils. Children can use them to trace or paint elements related to the theme. 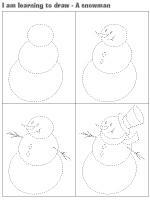 (Open educa-shape-Snowman-Circle) Print several copies. 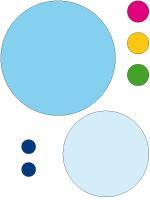 Have children color a few circles and cut them out. 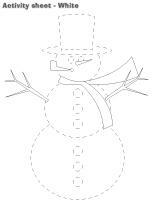 Encourage them to use the shapes to build a snowman by gluing them on a piece of cardboard. This activity can be done individually or as a group using the small, medium, or large shapes. 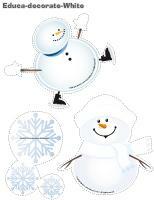 Invite children to complete their snowman by adding eyes, a nose, and various accessories. Have children draw on dark paper with white chalk, white waxed crayons, white wooden pencils, etc. Let children use cotton balls to paint on dark paper. Show them how to dip the cotton balls in paint and then stamp them on the paper. Collect round containers of different sizes (garbage can lid, plates, etc.). Give each child a large piece of paper. Let them trace the objects to create a snowman. Show them how the largest circle must be at the bottom, the medium-sized circle in the centre, and the smallest circle on top. 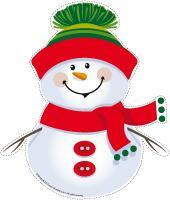 Ask children to decorate their snowman when they are done (hat, nose, mouth, broom, etc.). (Open craft-snowflake) Print and cut out. Let children glue cotton balls on their snowflake. Have children draw a winter scene on black construction paper using a glue stick. When they are done, sprinkle their drawing with flour. Shake excess flour off over a garbage can. (Open model-Snowman silhouette) Print for each child. Provide miniature marshmallows and glue. Encourage children to fill the snowman silhouette with marshmallows. Have each child paint a wooden spoon with white poster paint. Prepare a snowman nose with orange modeling dough and leave it out to dry. Cut a hat shape out of black felt. Glue the nose on the wooden spoon once the paint is dry. Use pink chalk to color the snowman's cheeks. Glue cotton balls on the handle to represent the snowman's body. Add tiny buttons on his tummy. Fill three white garbage bags with crumpled paper. Be sure to have a small, a medium, and a large "snowball". Pile them one on top of the other. Use a permanent marker to draw a face on the smallest one. Add accessories. (Open model-Giant snowman silhouette) Print the snowman parts. Have children glue them on a large piece of paper and cut them out. Use fasteners to assemble your snowman. (Open craft-snowman) Print the various snowman parts. Have children glue them on a piece of construction paper, color them and cut them out. Assemble your snowman by gluing the pieces on construction paper. (Open model-Snowman silhouette) Print for each child. Prepare popcorn. Have children dip the popcorn in corn syrup and then stick it on the snowman shape. Let dry. Use fishing wire to hang the snowmen from the ceiling. Using white poster paint, have children paint four Popsicle sticks (both sides) and sprinkle them with glitter before the paint dries. Once the paint is dry, glue two sticks together to form an "X". Add the remaining two sticks transversally. Let dry. Finally, attach invisible thread and hang the snowflakes from the ceiling. (Open complete the drawing-White) Print for each child and encourage them to draw the missing elements. 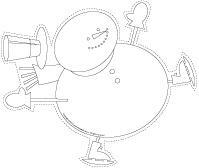 (I am learning to draw-A snowman) Print and laminate the model sheet. Encourage children to practice their drawing technique on the model sheet and then try to draw a snowman on their own. 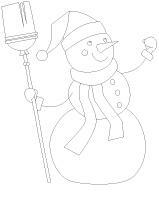 (Open coloring pages theme-White) Print for each child.